If it’s Halloween as you are reading this then you are in exactly the right place; if it’s not that particular time of year then don’t rush off to another page, we would not recommend passing up a seasonal online slot because it might be fun to play anyway. 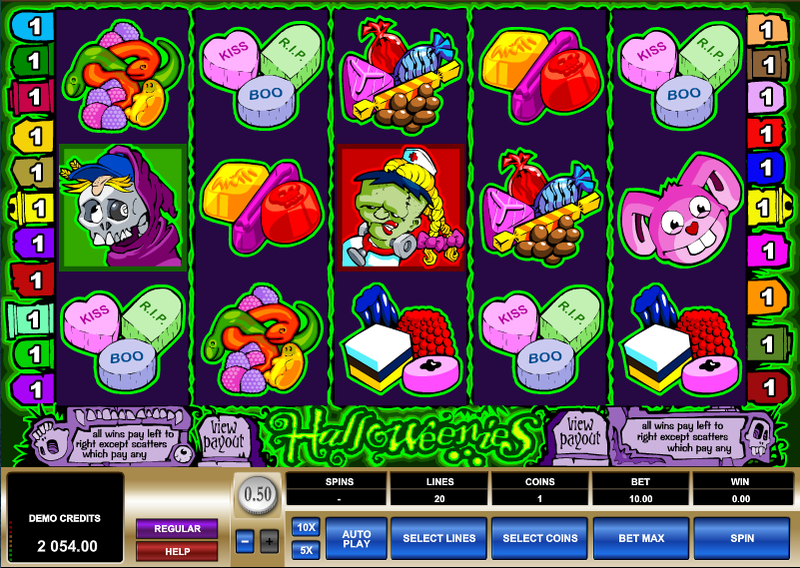 This one’s from Microgaming, it’s called Halloweenies and it’s a colourful tribute to that increasingly popular celebration. The wild symbol is represented by an animated selection of sweets and there are two scatter symbols – a pumpkin and a pink rabbit – which activate the features. All you have to do to trigger this feature is land three, four or five of the pumpkin symbols anywhere on the reels. Now just pick three of the pumpkins which appear on screen for a cash prize – the more pumpkins that trigger the feature, the higher the prizes will be. You will also win a scatter payout for the combo. Landing three, four or five of those pink rabbits will reward you with a spooky thirteen free spins. During this feature all wins will be tripled and it’s also possible trigger the Pick A Pumpkin Bonus from here. Additionally it’s also possible to re-trigger the spins by landing three or more pick rabbits. Low rollers might like the opportunity to have the same chance of triggering the features by playing just one payline. Those features are triggered by scatter symbols which don’t need to be on an active payline. Halloweenies probably isn’t compelling enough to play it outside that particular season but if you fancy a cheerfully scary slot then give it a go, but only at the end of October.